When it comes to summer morning staples, you can’t get much more “summer” than a blueberry muffin. Right? 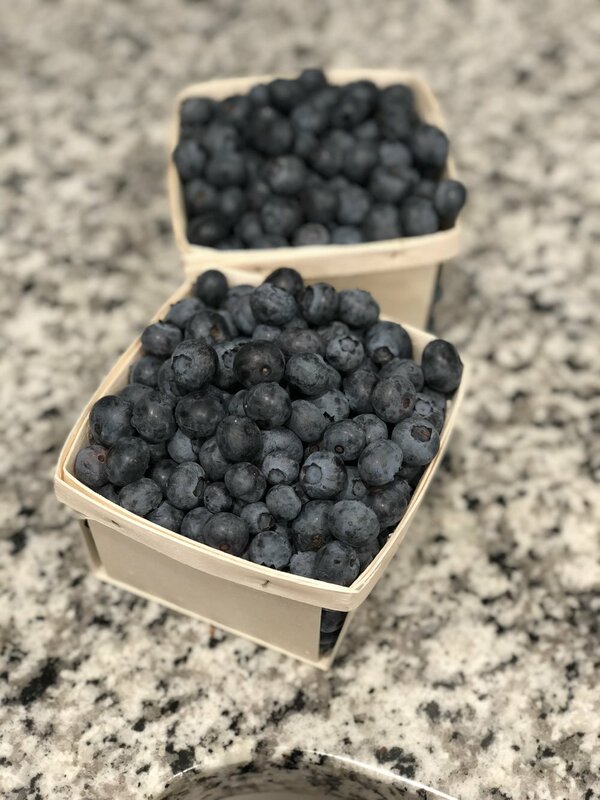 So when I decided to make the blueberry muffins of the famed Jordan Marsh department store (it’s been closed for quite a while) I knew I had a somewhat hefty task at hand. You see, my grandmother and mother have been baking these muffins for decades and only now do I dare to try and make them myself, gluten free flour and all. I’ve eaten so many of these muffins pre-Celiac, so I fondly remember their taste, texture, scent, and yum-factor. Not only do I find them awesome, but they are one of Seth’s first food memories when meeting my family for the first time in Maine. My grandmother had whipped up a fresh batch upon his arrival so that the incredible aroma filled the air of the home. What a way to meet everyone! So, how did my GF version turn out? Read on for the delicious details! Source: I Googled the phrase “Jordan Marsh Blueberry Muffins” and a myriad of options appeared! I selected the one that was featured on a local TV show, Chronicle, where the creator of these muffins explained them in detail and shared the recipe. There are many sites that provide it too, but I chose to get the recipe from the man who made them famous. Feel free to select any of the other recipes that are available. The majority seem to be fairly similar to one another. GFMD Taste Test: My skepticism almost got the best of me when I was creating the batter, but luckily I forged ahead and completed baking the muffins. Much to my surprise and delight, they were delicious! 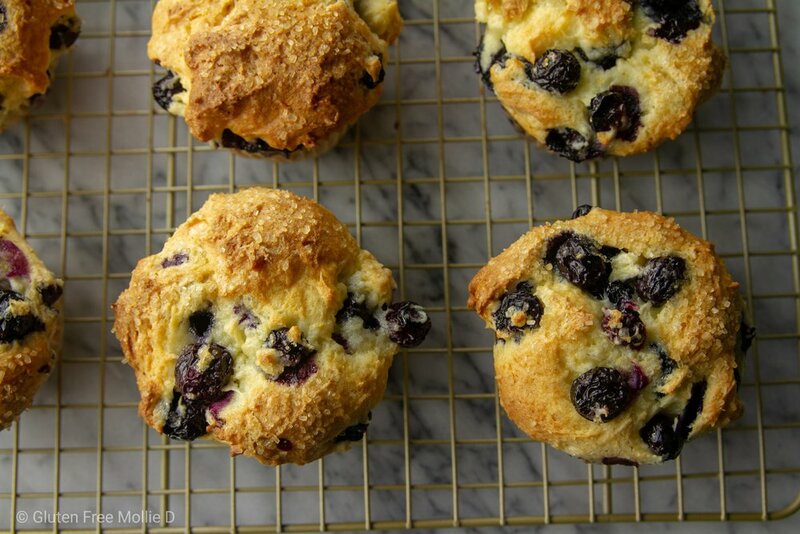 Fluffy and flavorful, plus plentiful blueberries, these muffins tasted (almost) exactly as I remembered them. And don’t worry, I didn’t forget the crunchy sugar on top! An essential final detail. Of course, the GF flour resulted in a smidge of difference in terms of batter consistency, but honestly, they were pretty darn close to the original! My attempt at creating these (locally) iconic blueberry muffins was a delicious success! Tips for Bakers: Be aware that your muffin batter will more closely resemble dough and it will not easily spill into the muffin tins. I had to scoop individual portions into the tin. I guarantee that’s due to the GF flour, so don’t panic. It won’t affect the final outcome. And, while they may look a little less-traditional in terms of muffin shape, the flavor is still great. 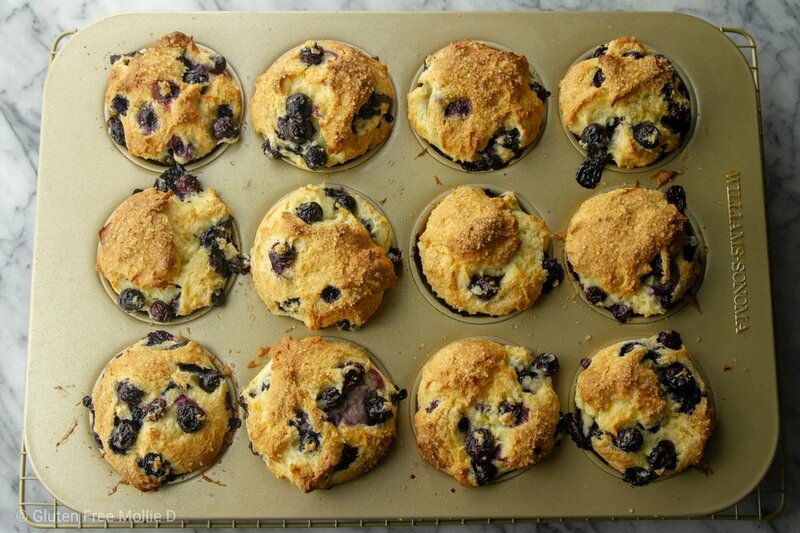 The blueberries do not sink into the batter like they do with non-GF flour, so they kind of poke out of the muffin, clear of any batter touching them. Photos below to better explain! May I suggest? Sure, gluten free muffins may not be 100% like non-GF muffins, but I am quite pleased with these blueberry muffins. And they would be perfect for your next brunch or daily breakfast treat. What I love is that they do remind me exactly of the muffins my grandmother used to make all of the time during the summer, and for me, that’s the best part. Coconut chocolate chip cookies! Cheesecake bars! It’s all so good!